A friend of mine has scratched her Ruby with another of the same gemstone. The scratch is little, and just on the surface. Is there any way to restore the polish? 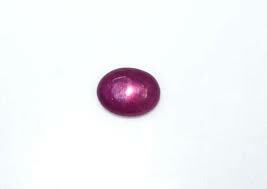 The ruby is smooth, similar to the one in the picture, and blood red. If the scratch is small enough but has discolored edges (like a scratched or chipped glass) then you could rub some vaseline or silicone oil over it to even out the light refraction. If the scratch is deeper, I'm afraid there's not much you can do but grind the stone down and polish it again. Filling the scratch with things like clear nail polish, spray varnish or epoxy resign will most likely end up with an unnatural look. And you would have to treat the undamaged stone as well or their color and gloss will differ. I strongly advise against using any abrasive material on the stone yourself. In the best case you end up dulling the gloss, worst case you just add more scratches. If you decide to repolish the stone, let a professional do it. Not the answer you're looking for? Browse other questions tagged jewelry restoration stones or ask your own question. What are the advantages of a lapel “coat stick” pin over other pin styles?